This sterling silver Claddagh ring has a 3/8" tall wishbone shape design that features channel set lab created emeralds and CZ stones in an alternating pattern. 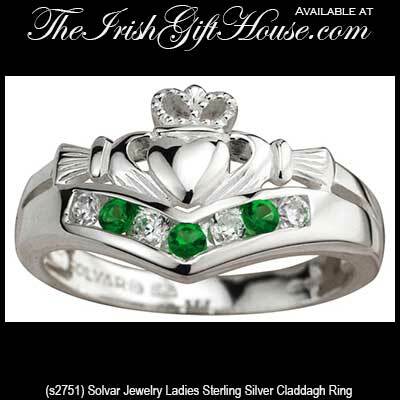 This piece of sterling silver jewelry is gift boxed with the Galway Folklore that explains how to correctly wear the Irish ring along with Claddagh legend card, complements of The Irish Gift House. 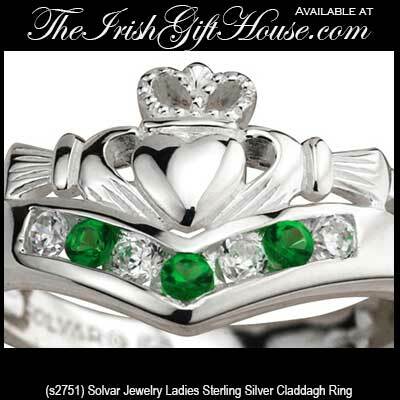 The emerald Claddagh ring is made by Solvar Jewelry in Dublin, Ireland.